If you listened to this past Sunday’s show, Straight Talk, thank you. If you missed it, wow, you missed something special. So often women say men don’t communicate. Well, on this show, several men communicated exactly what they needed from the woman in their lives. In this amazingly open and transparent discussion, most men expressed a common theme about their needs from women. It was support, communication and intimacy/love. 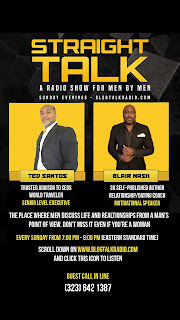 Not only did these men clearly articulate their needs, they gave details and examples of what they meant by support, communication and intimacy. 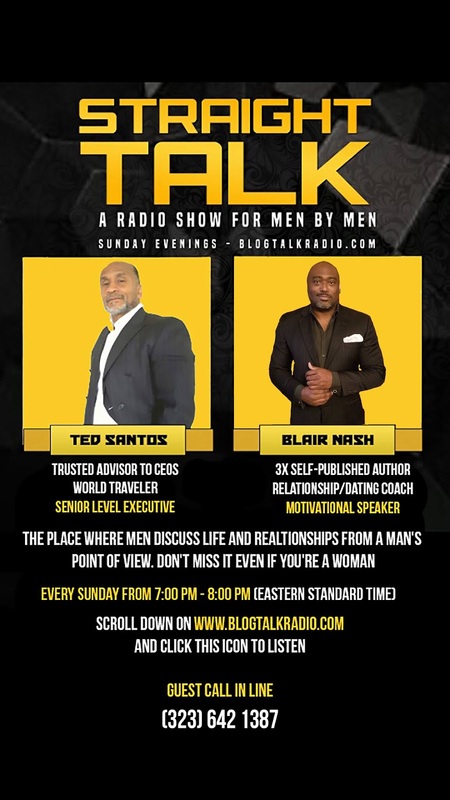 As anticipated, Straight Talk with Ted Santos and Blair Nash has become a platform for men to discuss their perspective about love and relationships. It’s the perfect place for young men who have grown up without a father in the home. The conversations give young men an opportunity to hear guys of all ages discuss relationships, expectations and responsibilities. In addition, for the ladies of all ages who are struggling to understand men, this is the best place in the world to hear men, uninterrupted. And the show allows women to call in and ask their toughest questions. Next Sunday, November 11, the topic will be just as engaging and perhaps controversial. Straight Talk is the place where you can speak about the things everyone avoids. Join us!